This section is filled with information for winery owners, wine grape growers, winemakers, tasting room staff and others related to the Colorado wine industry. The documents and information on this page were originally sent out to the Colorado wine industry in the email newsletters from the Colorado Wine Industry Development Board. If you would like to be added to the Colorado wine industry emailing list, please contact doug.caskey@state.co.us or 303.869.9177. The Food Safety Modernization Act of 2011 made the most wide-ranging changes to the growing, production and manufacturing of food, which includes beverages such as wine and cider. This section provided resources for both wineries, subject to the Preventive Controls for Human Food rule, and grape-growers, under the Produce Safety Rule. Access documents about the history of the Colorado wine industry here. Access resources on how to improve quality in the vineyard and in the winery. Access materials to assist in developing your business. Link to various wine-related government websites here. Access videos and presentations here. This section contains resources for Colorado grapegrowers. USDA Specialty Crop Block Grant funded program to provide an educational networking series for the Colorado Wine industry focusing on specific wine grape varieties. From the Journal of the Western Slope (Volume 11, Number 2). A promotional booklet c. 1896 from the Commissioner of Immigration for Mesa County, Colorado detailing the bounty and advantages of the Grand Valley. The Rocky Mountain Association of Vintners and Viticulturalists and The Western Colorado Business Development Corporation requested that Compliance Service of America provide this report on the various options for winery licensing that would create greater opportunities for winegrape growers to turn their crop into wine. Brief overview of 2018 Legislation that might impact wineries. An overview of how the Food Safety Modernization Act applies to wineries and how wineries can comply with the new rules. Compilation of rules from the Code of Federal Regulations regarding record keeping to comply with the Bio Terrorism Act. Developed for the CWIDB by Scott Roy, Food Safety Solutions, LLC. Edited and presented by Tamla Blunt, Colorado State University Food Safety Training Center. Overview of the record keeping requirements for wineries under the Bio Terrorism Act to maintain traceability of products. Developed for the CWIDB by Scott Roy, Food Safety Solutions, LLC. Edited and presented by Tamla Blunt, Colorado State University Food Safety Training Center. The Colorado Department of Agriculture has entered into a cooperative agreement with the US FDA to implement the Food Safety Modernization Act Produce Safety Rule, “, which establishes science-based minimum standards for the safe growing, harvesting, packing and holding of fruits and vegetables grown for human consumption.” This article from Morning Ag Clips reprints the announcement from the FDA and outlines the agreement with other states working with the FDA, however, Colorado is included. The CDA has teamed up with CSU Extension to create a resource and information web page to answer your questions about the Produce Safety Rule and FSMA. Information about exporting Colorado products through the CO Department of Agriculture. Cabernet Franc Cultivar Camp with Masterclass tasting led by special guest Ashley Hausman Vaughters, MW. Merlot Cultivar Camp with Masterclass tasting led by special guests Sally Mohr, MS and Max Ariza, CWE. Riesling Cultivar Camp with Masterclass tasting led by special guest Morten Hallgren, winemaker/owner Ravines Wine Cellars. Syrah Cultivar Camp with Masterclass tasting led by special guest Jeb Dunnuck. Wineries must register with the Colorado Department of Public Health and Environment (CDPHE) as food manufacturers. The CDPHE is also the in-state contractor for FDA’s compliance efforts under the Food Safetey Modernization Act. Find the link on this page to register as a food manufacturer, and note that a winery is only responsible for the $100 annual application fee and not any additional registration fee. Contact Jon Strauss, jon.strauss@state.co.us with any questions. 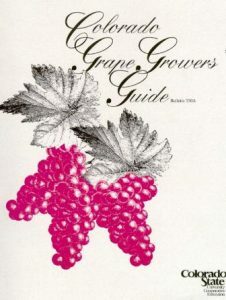 Although this guide comes from the early days of grape growing in Colorado, the information is still critical to the decisions of where to plant grape vines and which varieties to select. Compiled by CSU MSc student, Jonathan Sautter, in fulfillment of graduation requirement with funding from a Specialty Crop Block Grant awarded to the CWIDB by the Colorado Dept. of Agriculture. Colorado State University Extension and the College of Agricultural Sciences, the Colorado Department of Agriculture and the Colorado Wine Industry Development Board collaborated on the publication of this bulletin. State of Colorado division in charge of Colorado liquor and tobacco laws and regulations through education, outreach, licensing, inspections and enforcement activities. Colorado Proud, a program created by the Colorado Department of Agriculture in 1999, helps Coloradans choose and experience quality products that are locally grown, raised or processed.